On Sunday, November 4, 2018, the Mission Doctors Association recognized our longtime volunteer, Aurora Prize Laureate, and internationally renowned humanitarian, Dr. Tom Catena as the Catholic Doctor of the Year, with the “World of Difference Award”! Ken Carlson, longtime friend and director of the documentary about Dr. Tom – The Heart of Nuba – was on hand to receive the award on Tom’s behalf at the Cathedral of our Lady of the Angels, in Los Angeles. Ken Carlson accepts the Doctor of the Year Award on behalf of Dr. Tom Catena. 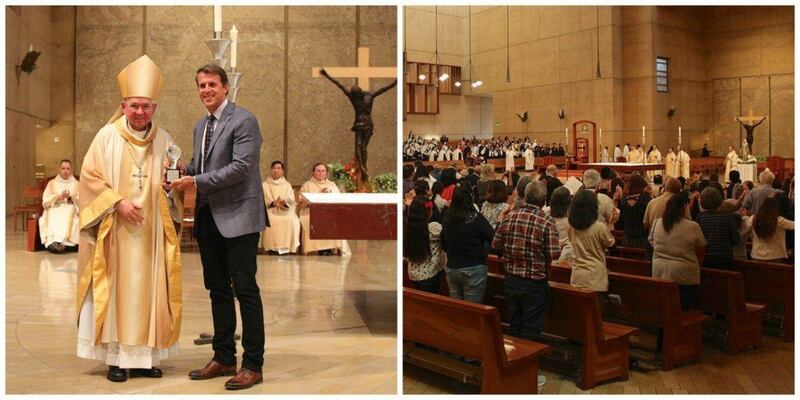 The ceremony took place at the Cathedral of our Lady of the Angels, in Los Angeles. Tom is one of the finest human beings I’ve ever met. He is as close to a “saint” as they come. He loves the Nuba people. He is extremely committed to giving the best possible care to every patient. – Dr. James Peck, a surgeon who has stepped in to cover for Dr. Tom on several occasions. “Having sent out more than 1,000 nominations nationally, the assignment of choosing one deserving physician among the many is always challenging. These deserving doctors with diverse experience and involvement make it challenging to choose only one to recognize. 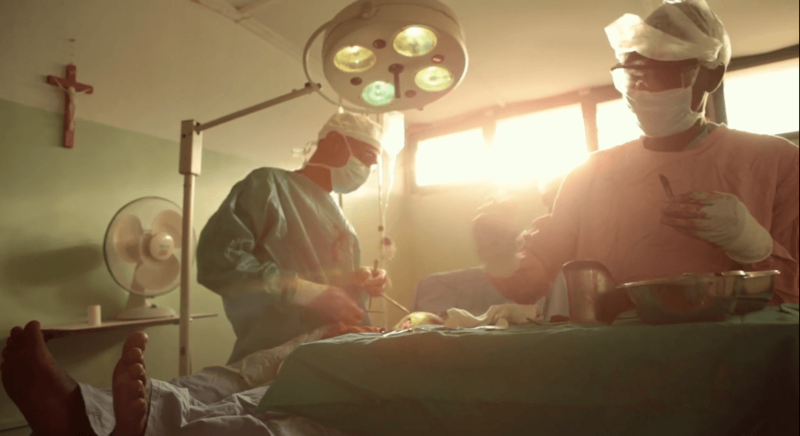 Candidates included individuals working with indigent populations and the under-served in the United States, as well as doctors like Dr. Tom Catena who have served as medical missionaries in countries around the world. 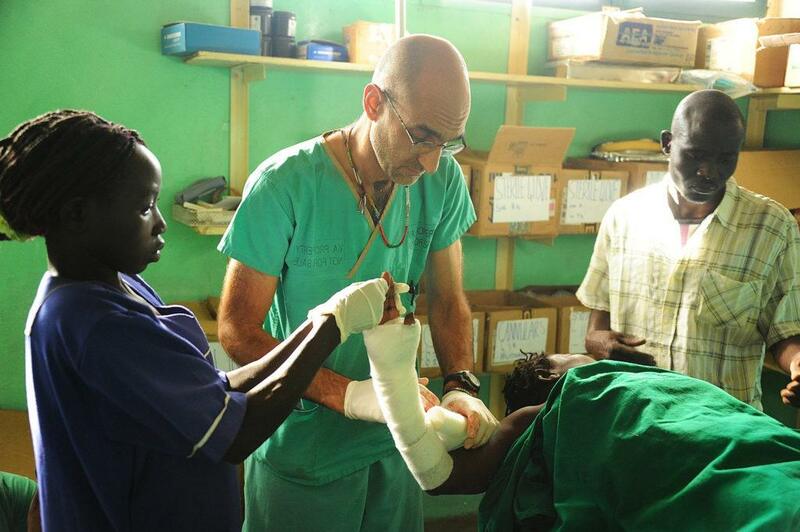 Dr. Tom is the only permanent doctor serving at Mother of Mercy Hospital in the Nuba Mountains of Sudan. The hospital serves a population of 750,000 people who have been subjected to years of violent conflict and aerial bombardments from the Sudanese government. 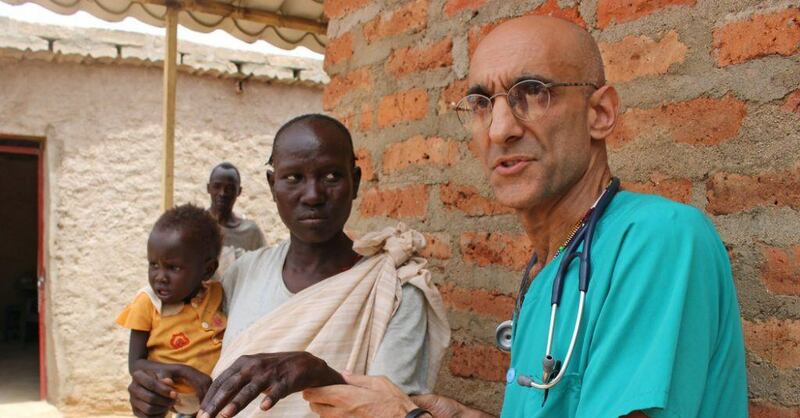 Dr. Tom has been serving in Sudan for over 10 years. “Dr. Catena is far more than a humanitarian,” said Elise Frederick, Mission Doctors Executive Director. “His faith both drives his work and gives him the strength to endure the numerous challenges he faces daily.” This award is a chance for patients, colleagues, friends, and family members to recognize a truly outstanding Catholic doctor. We are proud to support Dr. Tom, Mother of Mercy Hospital, and his lifesaving care for the Nuba people. Dr. Tom is an inspiration to all of us here at CMMB.